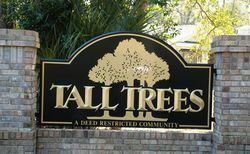 Tall Trees is a well-kept deed-restricted community located off Wayside Drive just south of SR 46 in Sanford – west of I-4. It consists of approximately 135 homes on spacious wooded lots built by both various custom builders and Centex. The community features large and beautiful old-growth trees and both a community pool and tennis courts. Shopping and restaurants are very close by in the Dunwoody Plaza, Seminole Towne Center Mall as well as Heathrow’s Colonial Towne Center and Park Place. Access to I-4 is less than 5 miles away for easy commuting.